Two eventful months in the capitol of the United States are over. During these two months, I have been living with young people from many different countries. A short, emotional, and educational period of my life has come to an end. The last eight weeks were a big challenge. I got to know all these people and was drawn into such interesting conversations, but sadly, only until I got to meet the next, new connection. There was not much time to reflect; no time to become more familiar with these fascinating people; no time to pay them more attention. Two months is so short. Due to my short stay, we did not have time for trips or common hobbies. Nevertheless, meeting you has changed my world. It is time to pause and ask: What remains? The answer is hope. 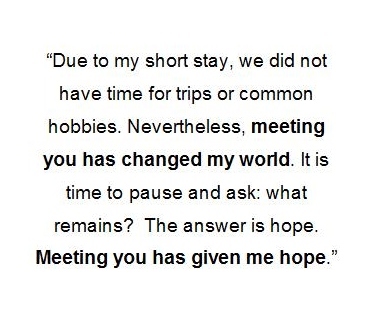 Meeting you has given me hope. Sure, I am from wealthy Germany. I am a European. One could take that feeling of hopelessness as unjustified complaining. But I have been scared about our future in these past years. Terrorism has reached France and Germany, too. We, the committed Europeans, had to discover that Europe, our peace project, is in danger. On top of that, 200 refugees are drowning in the Mediterranean Sea every week, trying to escape to a life worth living. Alternative facts are eliminating the foundation of legitimacy for our democracies: truth. All of this makes me want to give up on my studies. There is no way I can just do nothing. I want to take action. But how? It feels like everything I am trying to do does not help. Before I travelled to the US, I was feeling truly hopeless. Raghuveer, from India, grew up in a town without electricity. It was pure coincidence that he learned English and had the chance to become an Indian lawyer. The majority of children in India do not learn English and, therefore, cannot attend university, as English is the language of instruction. He left India for the first time to complete a master’s program in Washington, DC. Once, Raghu said to me, “I have come a long way to be here, Anna.” He certainly had. Jiawei works for the United Nations. When he left China and came to the US, he had to form dumplings in a Chinatown restaurant for two years. No one knew he had the potential for more than that, he told me. People had to be convinced to believe in him. Other housemates accept living far away from home because they cannot practice in the professions they strive for in their home countries. Who needs a skeptical economist in China? Although you have achieved that much while still young, you are down to earth, open-minded, friendly, and never restrained. We can learn a lot from you. Modesty – that is my first lesson. Even in Germany, women do not yet have the same opportunities as men. Too much self-confidence, especially in young women, is not appreciated, only smiled at. Outward appearance is more important for woman than men, in all areas of life. Until now, I had not yet decided how to position myself in that context. Should I play by rules, be cautious and work for my aims and convictions silently? Or should I speak up for myself? At International Student House DC, I found women of my generation acting as role models. There are Senni and Sara, two Finns who are experts in International Politics. They are self-confident, stand up to their bosses and initiate bigger projects. There is Lisa, who defends Russia – her Russia – conclusive and engaging, giving an impression of her enormous potential. Her presence is so powerful, that former US Vice-President Joe Biden could not hold back in telling her that she herself could bring change in Russia. Next is Aura from Mexico, who takes a stand for Human Rights as a lawyer in South America. Then there is Tian from China who when meeting four unknown, high-ranked experts at the International Monetary Fund – frankly speaking – blew them out of the water. Rose, who had to live in refugee camps before she was granted asylum in the US, followed up learning English and catching up in school with university degrees and finally her first great job at an NGO. Acting confidently, being determined, not yielding to male sensitivities – that is your way and it is now mine too. The second lesson is learned. Who always carries a smile, a friendly word, and is up to something fun? Italians! There were always at least seven Italians at International Student House at a time this summer. They are easy to recognize: if they do not know a word in English they immediately start a loud, unmistakable discussion in Italian. Of course, I have already heard that we Germans are more of a quiet, reserved, not excessively friendly people. My time together with you these past weeks has forced me to acknowledge this for the first time in my life. You express such a zest for life that it feels incredibly good to be close to you. Each and every one of you has to be taken into one’s heart immediately. There is not a single person in the house who you do not greet with a broad smile. Andrea Mansi, an exceptional comedian, also provided many laughs. Whether it is Roberto, Nicolò, Paolo, Michaela, Carlo, or others, you are always ready to go out and have a good time. One day I curiously walked into the Great Hall because I had heard beautiful music. My very talented friend, Sun, played the piano while seven Italian men listened. I witnessed the same scenario when the second group of Italians arrived. You love art and life. At my last night, we all sat together in the Great Hall and were playing music. At some point Guiseppe took a guitar and started jamming some Italian song. Every Italian in the room immediately started singing or dancing. It was a manifestation of the pure joy of living. This does not mean that you are not professional, though. All of you either study, work, or are in a PhD program. You are diligent and successful. But you do not incessantly work on your degrees. You enjoy every second. Your joie de vivre – I put it into my bag and took it home with me – it is my third lesson. Thank you for every laughter we shared, and for opening my eyes. Ci vediamo a Roma. See you in Italy. We Germans have a complicated relationship with the US. On one hand, there are people who admire the US so much so, that they would rather live in the “Land of Opportunity” than in Europe. On the other hand, there are those who despise America. I am not talking about justified criticism now. I am talking about widespread, fundamental resentments. Some issues are reasonable to discuss and oppose, like massive gun-violence casualties, the unequal healthcare system, social injustice, and Guantanamo. However, a lot of Germans only see the negatives. The election campaign of 2016 and Donald Trump as the new President strengthened the all-embracing criticism of the US, our partner, and seemed to support the second group. When I returned to Germany a few days after the attack in Las Vegas many people said, “Thank god you got back home safely from those maniacs. These Americans are all crazy and dangerous.” The first thing I responded was that there is no such thing as the Americans. I have met many engaged, intellectual, kind-hearted, young Americans. David, Alex Beck, Rostaam, and Matthew, who you can always count on to be reading a good book, or to answer any question on domestic or international politics eloquently and adeptly. Manuela, Alex Plum, Rose, and Cameron, impress with their empathy for different languages and cultures. Cameron speaks Japanese and Chinese, was in Japan during the Fukushima earthquake and helped foreign journalists report from Japan with his language skills and cultural knowledge. These are all young Americans who are not blind with national pride (yes, that is the widespread stereotype about you). They are aware of America’s shortcomings, too, and are idealists who care about other people and fight for different policies. I met young Americans who carry the spark of Kennedy and the Obama-charm. From a European perspective, these are Americans one can imagine a trustful and efficient collaboration with in the future. Simplification and generalization only benefit the enemies of democracy. Lesson four is having experienced a more nuanced America. When a Chinese laughs with a Taiwanese at the breakfast table; when Jonathan explains how he will create jobs at home in Nigeria as soon as he gets back; when Cem states that most Turks love democracy so much they will not stop fighting to protect it, then hope remains. I met so many inspiring personalities at International Student House, people who fight in every corner of this world to make it a better place. Our generation is the first one who is mobile on such a high scale and able to easily make friends around the world. Our generation is the first that, with the help of social media, is capable of maintaining these contacts and can call on them – if needed. We have to cope with the same global challenges, have to fight for more justice, liberty, and the preservation of our livelihoods. The International Student House offers an exceptional opportunity to find worldwide allies to tackle these challenges together. It definitely lives up to its aspiration of global peace promotion through bringing together youths from around the world. When it comes to me, the time spent at ISH has given me back hope for a (more) peaceful future. Many thanks to all of my fantastic housemates, ISH-employees and the members of the Board.